In order to utilize the high sensitivity of the fluorescence detection system for sedimentation equilibrium in analytical ultracentrifugation, a new evaluation method was developed. In comparison to absorption recording the sensitivity could be raised 100–1000 fold as shown for a series of proteins (bovine serum albumin, immunoglobulin G and chymotrypsin). Sedimentation equilibrium runs can be analysed down to sample concentrations of 0.25 ng/µl with a minimal sample volume of 40 µl. The accuracy of the molecular weights is comparable to that recorded by the absorption optics. Analysis of infectious prions in the analytical ultracentrifuge requires strict safety conditions. A biohazard safety containment with a vacuum system is constructed to prevent contamination of the laboratory. Decontamination of the cells is ensured by the use of self-manufactured titanium cells, which could be autoclaved at 134 °C in 1 N NaOH. 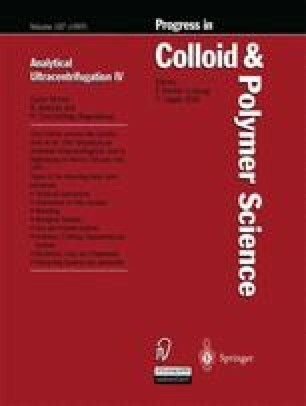 Analysis of SDS-solubilized PrP(27–30) which is a N-terminal truncated fragment of the whole prion protein, showed by anlytical ultracentrifugation relatively homogeneous fractions with molecular masses between 20.000 Da and 120.000 Da, depending on the conditions of solubilization.